Othello is the first of the NYT REP Company's productions put on at the Ambassadors Theatre. 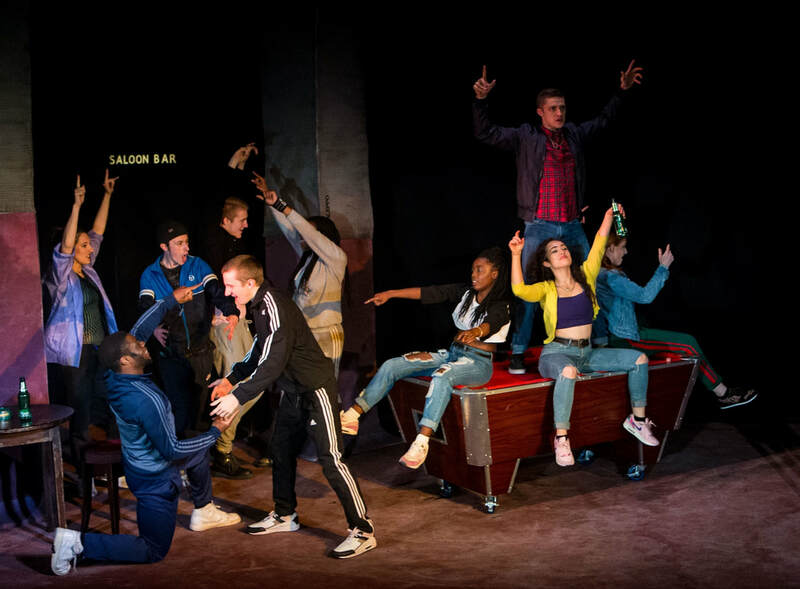 The REP Company is a 9 month alternative to drama school for members of the NYT, culminating in a 3 month run at a West End Theatre of a couple of shows, this year: Othello and Jekyll and Hyde. The 16 strong cast are all aged between 18 and 25, but in terms of talent, there is nothing differentiating them from the most experienced professionals in the industry. This version of Othello has been adapted by Scott Graham and Steven Hoggett for Frantic Assembly - a physical theatre company. It is set in a Yorkshire pub called "The Cypress" (Shakespeare's original is set in Cyprus). An opening movement sequence establishes the characters: a rowdy and, on the large part, drunken gang of youths gathering in the dingy and grotty Cypress. Loud music pulsates while the cast move (one might say frantically) around the stage with such speed and energy that within 5 minutes everybody is sweating profusely - creating perfectly the busy, riotous atmosphere of the pub. The acting was practically flawless. Curtis John Kemlo brought delightful humour to the piece as the innocent Roderigo, hopelessly in love with Desdemona. In the final scenes of the play, there was beautiful acting from Megan Burke and Rebecca Hesketh-Smith as Emilia and Desdemona respectively, each in their last moments before their death. Mohammed Mansaray clearly depicted the transition of Othello from a loving, respected man to a man driven mad by jealousy and anger. The performance of the evening was Jamie Rose as Iago. He speaks the Shakespeare so naturally that it felt like normal, everyday language. It was so easy to understand, I wouldn't be surprised if he goes on to become one of the great Shakespeare actors. The set initially appeared simple - merely 3 pillars, a couple of tables and chairs and a pool table. It was, however, used in ways I could not have imagined and to remarkable affect. In one scene, as a drunk Cassio (played brilliantly by Eddie-Joe Robinson) staggers around the stage, the pillars and ceiling tilt in all directions, accentuating his drunkenness. Additionally, as Othello was strangling Desdemona, the pillars began to crumble, lowering the ceiling closer and closer to the pair. It felt almost oppressive as every last bit of air was being squeezed out of her. Sound and lighting also played an integral part in this production. Loud music and bright lights characterised the noisy, hectic atmosphere of the pub. Occasionally they were stripped back to a bare minimum, creating delicate tension that drew out some key moments in the play. Some sections of the play were told with movement, as eloquently as any words could have. In particular, the establishment of the importance of the cloth that Othello had given to Desdemona, is told through a small piece of physical theatre between the two characters using Frantic Assembly's "Round, By, Through". The whole production was wonderfully put together, the acting, the lighting, sound and stage design, the costumes and importantly the physical theatre aspect. 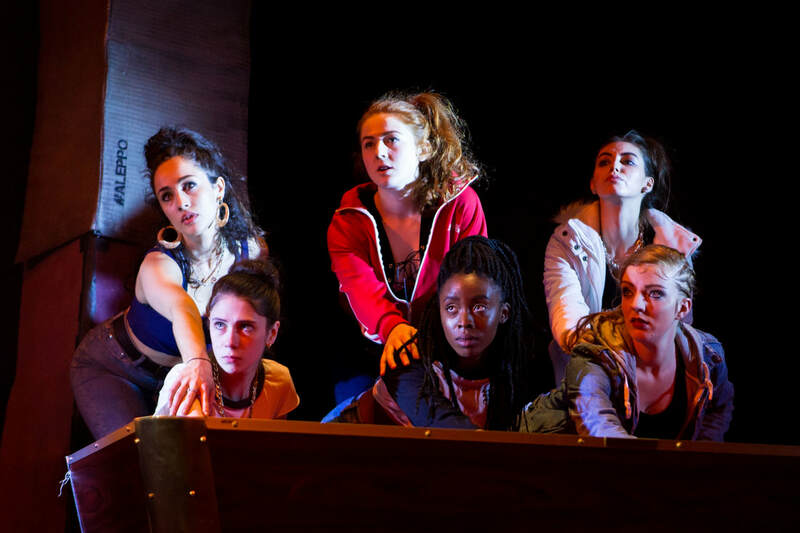 Frantic Assembly's version of Othello is refreshing and engaging. I challenge anyone who thinks that Shakespeare is boring, irrelevant and incomprehensible to come and see this production, featuring the stars of the future, and then re evaluate.